Later essays by Burleson venture into more challenging territory, as his bold adoption of poststructuralist literary methodologies have led to new ways of looking at Lovecraft’s work. Examining the Providence writer through the lens of deconstruction, Burleson provides innovative interpretations of Lovecraft’s prose style, his use of gender, and his relations to such writers as Herman Melville and Friedrich Nietzsche. As a practicing mathematician, Burleson has also studied Lovecraft’s use of cryptography and higher mathematics. 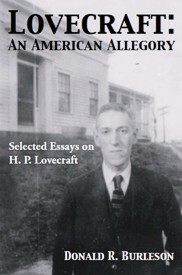 Burleson is one of the most sensitive students of Lovecraft’s oft-neglected poetry, writing penetrating analyses of such poems as “Nemesis,” “The Ancient Track,” and his touching poem on the death of a cat, “Little Sam Perkins.” In all, this collection is a concentrated distillation of the decades of work by a pioneering scholar. Donald R. Burleson is the author of H.P. Lovecraft: A Critical Study (1983), Lovecraft: Disturbing the Universe (1990), and other works. He has also written novels and story collections, and is the publisher of Black Mesa Press. With his wife, the writer Mollie L. Burleson, he lives in Roswell, New Mexico. Is Lovecraft’s “Ph’nglui mglw’nafh . . .” a Cryptogram? Lovecraft: An American Allegory. By Donald R. Burleson. New York, NY: Hippocampus Press; 2015; ISBN 978-1-61498-138-1; paperback; 260 pages.